Home » So this is what parsley is for. So this is what parsley is for. This recipe wrote itself last week when after making the clam-salmon stew, I had a baby plate of parsley sitting on the kitchen counter all night. I should have put it away but even with the heat whirring on much too often, last week was a cold, cold one. The parsley was okay. It was so okay that I chopped up a tablespoon of garlic and plopped it over my eggs which I fried in olive oil and a rosemary stem the next morning. I proceeded to sprinkle it with seeds, lots of lemon and whatever powdered, flaked pepper I felt like that day. Eating from that plate reminded me of the days we would eat bhaji for breakfast. Bhaji simply means vegetable and in Goa it’s a common breakfast or tea-time snack. The baby plate of whatever bhaji you chose would come with a side of chopped onions, a chilli, lime and bread. You would sprinkle some onions over the bhaji and squeeze lime over it before scooping it into your mouth with the help of a spoon and bread. If you wanted a puri (deep-fried flat bread), you could have that instead. If you’re ever in Goa, skip the beach shacks and go get mixed bhaji and chao (tea) first. But before I preach the “musts” of food in Goa like I’m some expert or something, let me tell you that there was once a time I did not know the difference between coriander/cilantro and parsley. To be able to make out the taste difference, one must grow up with it, which I did not. I had no idea that this famous American plate garnish was nothing like the coriander leaf I grew up with and ate like a snack. You might notice this in some of my old recipes where I use the two interchangeably, which was sometimes a happy mistake and other times, just plain strange. I have gotten a lot better at not doing this and instead feeling (or is it tasting? sniffing?) my way around which herbs I like and while I often pull the same ones off the green heaps at the grocery, I am always surprised by the ones that take me off the path. “Parsley? Really?” is what you’re probably thinking but if I’ve never tasted it in a chutney, what could I possibly do with it? I made an even fancier garnish invoking chermoula, gremolata, Parsi breakfasts and the best of them all bhaji-pao (bread). I took my cue from all the times I would go (and still do) for the garnish first, my favourite cookbook, ideas that I never thought would be worthy of a blog post and just a happy accident involving a leftover baby plate of parsley on the kitchen counter. While I’ve paired these fancy chopped herbs with eggs, it would be sooooooooo great on top of anything savoury (including a can of beans) and maybe even be used as a marinade. 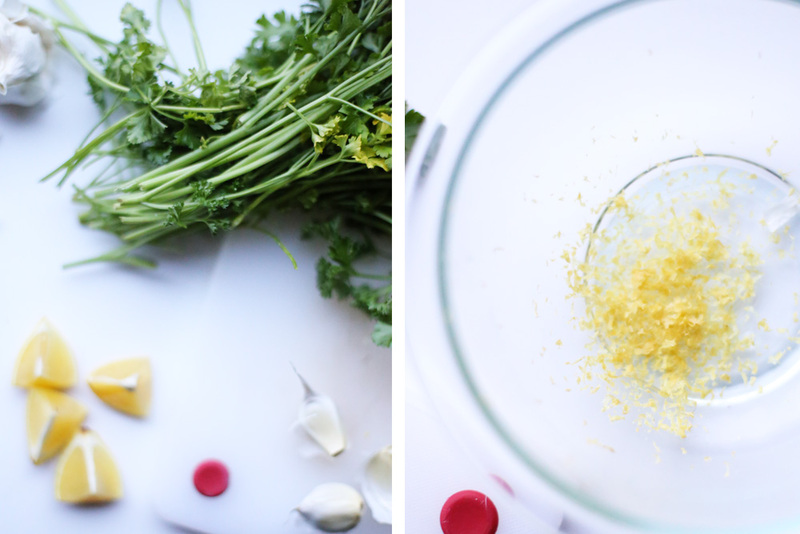 You can make this out of a mix of more than one herbs. Use more of one, less of another or whatever you like to get it tasting just right for you. I always make extra to put on eggs because it’s what’s easiest on mornings when I’m not quite awake and eating just toast won’t do. More than anything, this kind of recipe solves a big problem for me that lies in the realm of what to do with leftover herbs possibly dying at the bottom of the fridge. This recipe calls for toasted sesame seeds which you can do by putting them on a dry pan on medium heat and stirring occasionally until they turn fragrant (they smell nutty), about 5 minutes. 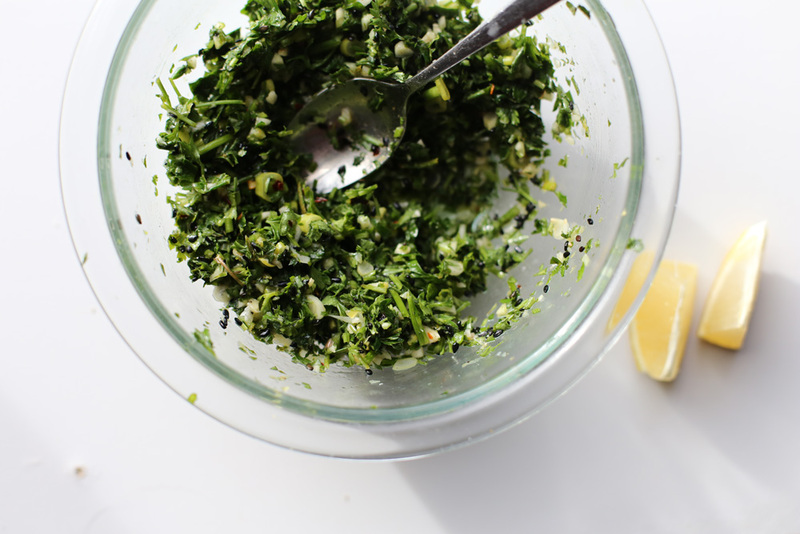 Prepare the parsley, green onion, garlic and lemon and put them in a small bowl with the red pepper flakes. Heat the olive oil in a pan on medium heat and add the rosemary stalk to it. Let the rosemary cook for about 3 minutes, as you swish it around allowing it to scent the oil. Drain the rosemary into the pan and set it on a cutting board. Remove the rosemary leaves from the stalk and chop them finely. Mix them in with the parsley. Cook the eggs into the same pan with the olive oil, in batches of 2. Fry until the whites have set and the edges are crispy. Scoop onto a plate and drain what’s left of the olive oil into bowl with the herbs. Pour in more olive oil if you want the herb mixture to be a little more loose or not if you prefer it “leafier”. Season with salt. 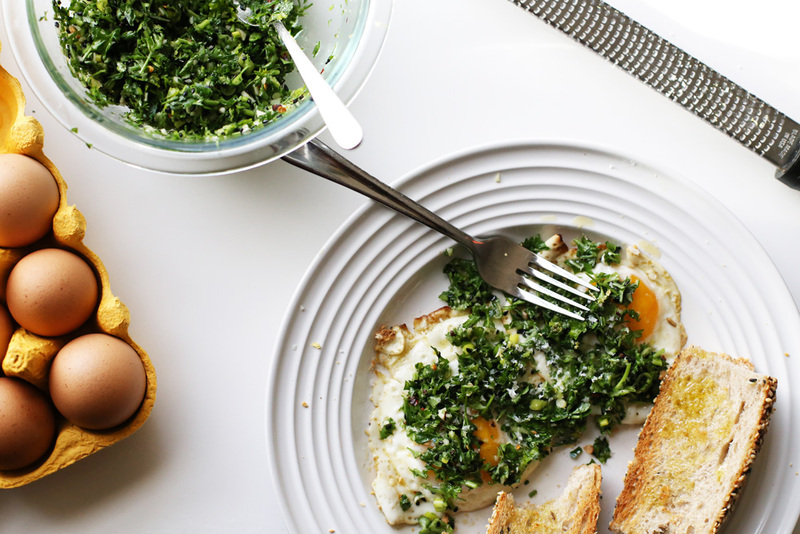 Spoon the eggs onto a plate and spread the herb mixture all over. Eat with toast and add more salt, pepper and lemon if you need to.